So, I’ve finally got through all the books in that package that turned up on my doorstop containing all these books……. 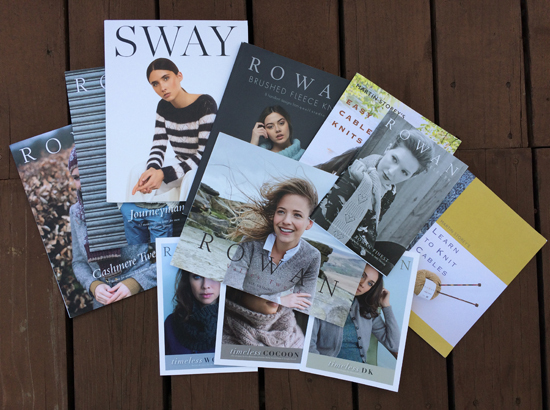 I’m looking through each book and choosing a few of my favorite designs. Here’s a look at the final two books and a few of my favourite designs. Kim Hargreaves seems to design for me; even her baggy garments, which don’t usually suit me, look as if I could wear them. In this collection, titled Sway, Kim uses these Rowan yarns: Kidsilk Haze, Creative Linen, Handknit Cotton; Original Denim; Cotton Glace; Summerlite 4ply; Summerlite DK; Fine Lace. Although these designs are more suitable for Spring and Summer (in fact this is not Kim’s latest book…that called Grey) they are also great for layering anytime of the year. I couldn’t choose just one as a favourite as I do like many designs in this book, so here is my top three. Fisher, a drapey garter stitch cardigan knitted in Kidsilk Haze with 2 strands held together throughout. The possibilities with changing the look of this cardigan is what I find exciting. In the photo, 2 different shades of yarn are held together throughout: Turkish Plum and White. Think about all the different colour combinations you could discover using the 33 shades of Kidsilk Haze! You could also make a one-color version using 2 strands of the same colour held together. I would love to knit up one in white, in black, pale pink, pale blue…..
My second fave is Osh, also knitted using Rowan Kidsilk Haze. Osh is a neat cabled Sweater with a generous neckline, although it is very hard to see the cable detail from this photo. And my third favourite is Mira, a neat cardigan with heart and braid detail knitted using Rowan Handknit Cotton. Again, hard to see the detail from this photo. I love Brushed Fleece! I have quite a bundle in my stash! It is light and lofty and warm without being overly warm and being a bulky yarn it knits up quick too! I was so excited on picking up this book but after flicking through it I was left disappointed. The designs are either quite basic or too big and baggy for me, but maybe that would appeal to a beginner knitter or someone younger than me. 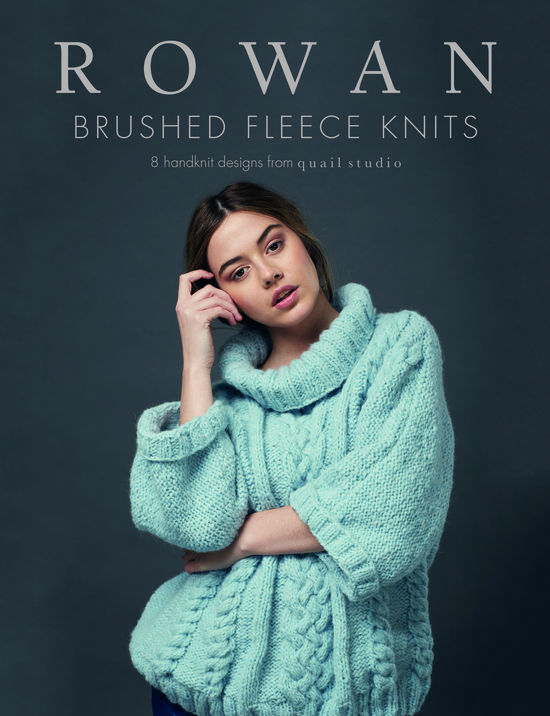 If only I was 20 years younger…… I might just love to knit up and wear the design on the front cover, Phoebe, and in that lovely blue shade, Fog.